The first signs of spring here in New York are the same elsewhere. Leaves and buds on the trees. Early flowers blooming. Sidewalk tables and chairs appearing at restaurants. But for those of us trolling the Greenmarkets, the first signs of spring are actual fruits and vegetables that haven't been sitting in a root cellar all winter. This takes a little more time. For me, spotting one particular item is the starting gun for spring (and summer!). 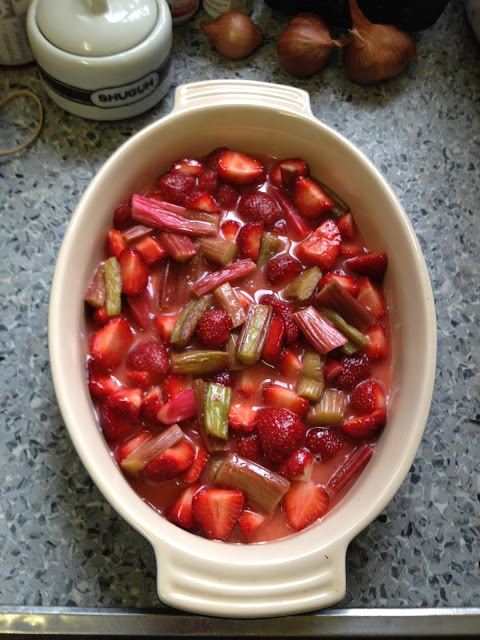 That great totem of spring is Rhubarb! As soon as it shows up at the Greenmarket in Union Square I buy a bag load. One of the many great things about rhubarb is it freezes well. So I buy a lot and freeze it for future use. That way I have it all summer. Once I have my rhubarb, the anticipation begins for the ultimate spring fruit, strawberries. Strawberries and rhubarb are my favorite duo. I love them in cakes, pies, crisps, cobblers, jams and compotes. They work so well together, complementing each other in taste and texture. 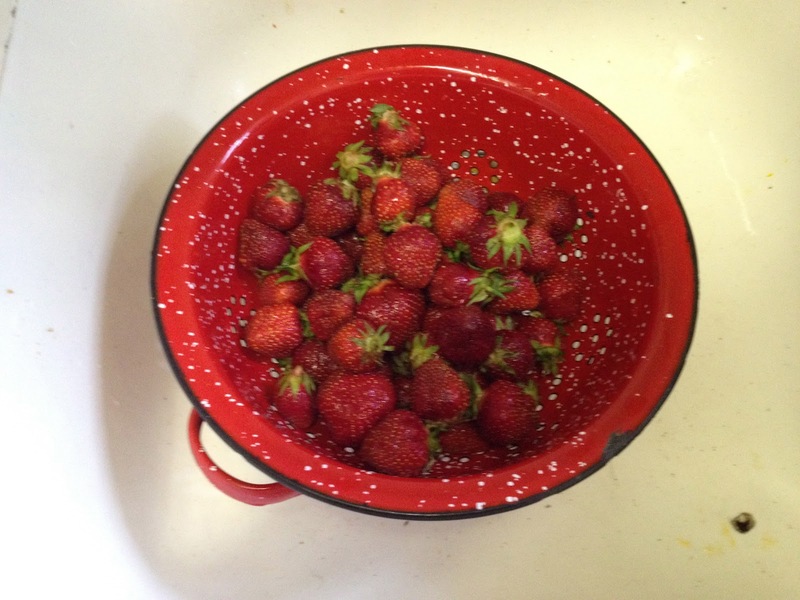 And, finally, here in NYC, we have strawberries! Strawberries and Rhubarb in hand, I had to make a dessert. Here is one of the simplest and delicious desserts you can make, and you will look like a star. 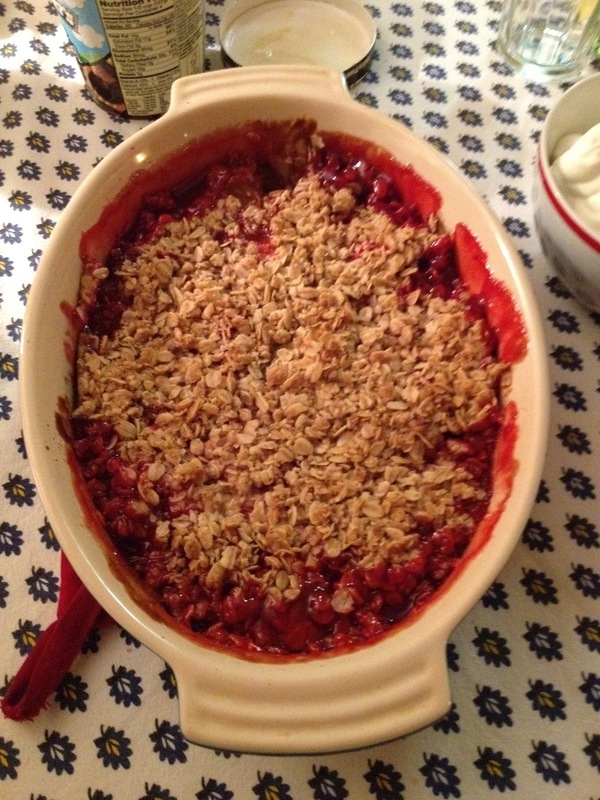 Strawberry-Rhubarb Crisp. The beauty of the crisp is there is no dough to make. I love making pies, but on a sunny Sunday sometimes you need something quick and simple to whip up. Plus, the crisp really lets the fruit stand out. They are the stars of the show. A few simple ingredients are all you need. And it is easy to adjust up. Unlike a pie or a cake, you have a little more leeway here. The original recipe here called for 8 ounces of both strawberries and rhubarb and 8x8 baking dish. Way to small for me. I wanted to use an oval baking dish so I upped the fruit to 10 ounces and jacked the other ingredients a hair. It worked fine. You could boost this to 12 ounces of each fruit and still have a great dessert. It is hard to mess up what is essentially fruit, sugar, butter and some oats. So here is the recipe. I promise it is simple and very, very good. Enjoy. Preheat your oven to 375 degrees. Position your rack in the middle of the oven. Stir the ingredients until they are well combined. Pour them into an oval baking dish (I used an 8x11"). You do not have to butter or flour the dish in any way. 1 1/4 cup rolled oats (That tube of Old Fashion Quaker Oats is fine). Stir until combined and a just a little clumpy. Sprinkle it evenly over the fruit to cover it. Bake in the oven for 40-45 minutes. Juices should be bubbling and the topping should be a nice golden brown. Remove and let cool slightly. You can make this ahead of time and reheat for a few minutes. Devour with vanilla ice cream, fresh whipped cream or on its own. The bounty of spring in a baking dish. This is as good as it gets. I promise you. wow. that looks yummy (and nice pictures, too). i love a crisp, a crumble, a brown betty. more than pie and WAY more than cake. i wonder how a little sweet marscapone would be on top...and if arabian stores have ever heard of rhubarb. ... hmm..